In 2018 consumers spoke loud and clear. They made it known that they expect to be treated as individuals and to receive timely, relevant and helpful communications from the companies they do business with. If they don’t? They may look elsewhere. In a study Smart recently conducted they found that nearly two-thirds of consumers are likely to switch vendors if communications expectations are not met. This is a powerful statistic. But are enterprises listening? Smart believe that they are, and that the decisions they make in 2019 will reflect this. What does this mean, specifically? 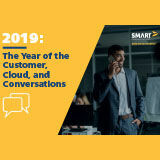 In the next twelve months the industry analysts and experts featured in this report predict an increase in the adoption of modern, cloud-based CCM platforms; a shift toward more business-user driven tools that allow for greater efficiency and agility; an increased focus on analytics to fuel insight-driven personalization; an adoption of more outside-in communications strategies; and much more. Malwarebytes' annual report examines threats by region as well as top industry verticals for the most prolific forms of malware.